Global climate talks received a symbolic boost today, as the G7 group of rich nations threw their weight behind a long-term goal of decarbonising the global economy over the course of this century. The joint communique from the leaders of Japan, Germany, the US, UK, Canada, Italy and France reaffirms their commitment to the internationally agreed target of limiting warming to less than 2C above pre-industrial levels. It also reiterates their commitment to deep cuts in emissions by 2050. Today’s declaration goes a step further, however, backing a long-term goal of cutting global greenhouse gas emissions at the “upper end” of 40-70% below 2010 levels by 2050 and decarbonising completely “over the course of this century”. These milestones are broadly in line with the path to avoiding more than 2C of warming, set out by the Intergovernmental Panel on Climate Change (IPCC) last year. The IPCC said this would require “near zero emissions of carbon dioxide and other long-lived greenhouse gases by the end of the century”. The 40-70% reduction on 2010 levels by 2050 is the range for 2C set out by research organization Climate Analytics earlier this year. It also just about reaches the 70-95% range of emissions reduction by 2050 that would be consistent with limiting warming to 1.5C. A review of whether to adopt this tougher temperature target is expected to conclude at UN climate talks in Bonn this week. The G7 declaration calls this year’s UN talks in Paris “crucial for the protection of the global climate” and says: “We want to provide key impetus for ambitious results”. It promises to put climate protection “at the centre of our growth agenda”. However, the G7 nations only account for 19% of global greenhouse gas emissions. Former Australian prime minister Kevin Rudd argued recently that the larger G20 needed to drive the planned global climate deal. The same 2009 G8 statement set a goal of cutting emissions by “at least” 50% by 2050 – within the 40-70% range set out by the G7 today. It said developed countries should collectively cut emissions by “80% or more” compared to 1990 levels. 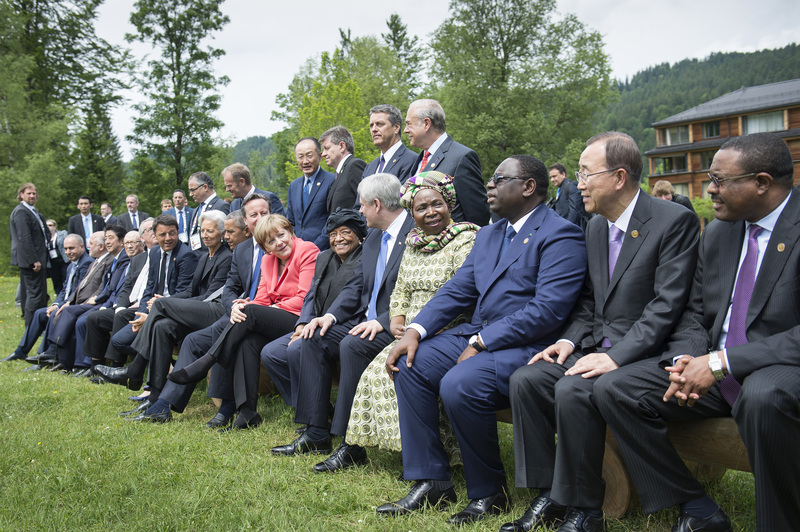 Group photo of the G7 leaders sitting together with their outreach guests on a bench. Source: Federal Government – Bundesregierung / Bergmann. Today’s text does not repeat this promise on developed country emissions. The novel element is its backing for potentially greater global ambition in 2050, along with complete decarbonisation by the end of this century. Statements from NGOs — and some newspaper headlines — added their own interpretations to this new pledge. The Guardian said the leaders had “agreed on tough measures” that would cut emissions by “phasing out the use of fossil fuels”. The Financial Times headline says “G7 leaders agree to phase out fossil fuels”. Greenpeace said the text signalled the fossil fuel age was “coming to an end” and that coal, in particular, must be phased out in favour of 100% renewable energy. Christian Aid made similar points, asking global leaders to follow the UK in committing to phase out unabated coal. G7 nations continue to rely on large fleets of coal-fired power stations, whose combined emissions are more than twice Africa’s total. The G7 language on decarbonisation this century is not specific, however, and does not promise an end to the use of coal or other fossil fuels. Instead, the language could imply reaching net-zero, where any remaining emissions are balanced by sequestration through afforestation or negative emissions technologies. The G7 “commit to” develop and deploy “innovative technologies striving for a transformation of the energy sectors by 2050”. The communique doesn’t explain which technologies would be considered “innovative”. However, the use of the plural term “energy sectors” perhaps points past electricity generation towards transport, heat and beyond. The declaration is thin on new financial commitments – despite some high expectations heralded by chancellor Angela Merkel’s announcement in May that Germany would double its contribution to international climate finance by 2020. The communique says that climate finance is already flowing at “higher levels”. All G7 countries have pledged various sums of money into the UN-backed Green Climate Fund (GCF) over the past year, although all countries’ cumulative contributions are still only around $10bn. This is well short of the $100bn a year that rich countries have pledged to provide every year by 2020. A significant proportion of this is expected to be channelled through the GCF. So far, there is no clear roadmap on how this money will be scaled up over the next five years – a source of contention for developing countries, which rely upon international donations to implement their own climate actions. In the statement, the G7 countries pledge to “continue our efforts to provide and mobilize increased finance, from public and private sources”. The statement also says that the G7 nations “pledge to incorporate climate mitigation and resilience considerations into our development assistance and investment decisions”. This could have particular implications for Japan, which is still investing heavily in coal plants both domestically and abroad. Despite its shortcomings, the stronger elements of the G7 communique were not easily won. Wording on the long term goal could reverberate at the UN negotiations taking place this week in Germany, sending a message about the pressure that countries such as Japan and Canada are under to toe the climate line. Both nations have faced criticism for low ambition in their INDCs (still due to be finalised in Japan’s case), yet have nonetheless agreed to a statement pointing towards a decarbonised economy by the end of the century.